James Lewis Dalton (Jimmie) was born on 28 December 1866, in Dalton Farm (a homestead near Ponder, Ripley county, Missouri). He was the son of William Marion Dalton and his second wife Mary Caroline (Myatt) Dalton (b. 9 October 1838 in Dickson, Tennessee—d. 12 April 1890 in Ripley, Missouri). 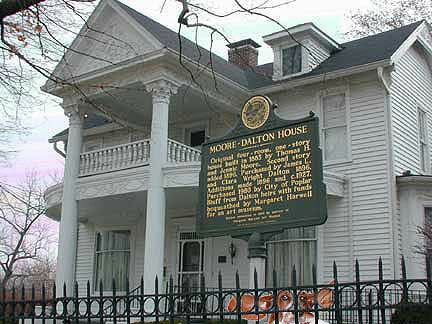 William Marion Dalton was born in Missouri on 30 May 1834, to Elijah Dalton and Zillah Gaines. He was the first postmaster of Dalton, Arkansas. On 18 November 1855, William Dalton married to Mary Caroline Myatt and they had 9 children. He passed away on 7 September 1873 in Ripley, Missouri. In 1875 Mary Caroline re-married to Asebel (Asel) Arnold and they had 2 children. The life story of James Lewis Dalton would be appropriate subject matter for a "rags-to-riches" story. He rose from the position of a poorly educated backwoods boy to become the owner of the largest department store in the Middle West and head of one of the world's largest business machine manufacturing plants, devoted to the manufacture of the Dalton Calculating Machine. When a small child, living with his mother and other children, Jimmie was constantly engaged in experimenting with machinery. An older member of the family once said that James was "all the time fooling with wheels." In 1880 at age 14, he made an exact model of his mother's sewing machine in wood, and surprisingly it worked. As a boy Jimmie attended the country schools near his home. Some of these schools were at Bakerden, Warm Springs, Doniphan and at Dalton. In the early 1880s he was educated at the LaCrosse Collegiate Institute in Izard County, AR. Later Jimmie (at the age of 16 ) taught school for a time at Dalton, Bakerden, and seven months at Elm Store, assisted by his sister, Neeta. In 1884, when he was 18, Jimmie decided to go forth into the world and seek his fortune. With $60 which he obtained from a bale of cotton which he grew in the hills of what is now Baker township, Randolph county, he set forth. He first went to St. Louis. Finding no job he went on to Chicago. Finding nothing to his liking he came back to St. Louis where he obtained a job in the old William Barr Dry Goods Company at a salary of $5 per week. After working there a short time he came back to Doniphan, where he went to work in a hardware store of his future wife's Clara relatives at $12 per month and board. He was soon made a partner and later became sole owner. He built this business up to where he saw greater possibilities in the larger town of Poplar Bluff, to which town he moved in 1885. It grew to be the largest department store in the whole Midwest and one year the retail sales reached $765,000. At the age of 22, while living in Doniphan, Dalton was elected Master of the Masonic Lodge. At 26 he was District Deputy Grand Master of the State of Missouri. He was the first Republican ever elected to the State Legislature of Missouri from Ripley county. In 1904 Dalton turned the store over to his son and others (although he retained controlling interest in the concern) and devoted his entire time to the adding machine. Soon the machine began to sell on the market and 200 sales offices were ultimately opened up in different parts of the world, and sales ran up to $1,000,000 worth a month. James L. Dalton was a brilliant speaker and writer, the recipient of requests from leading chambers of commerce and other civic clubs throughout the country to address their conventions and banquets. 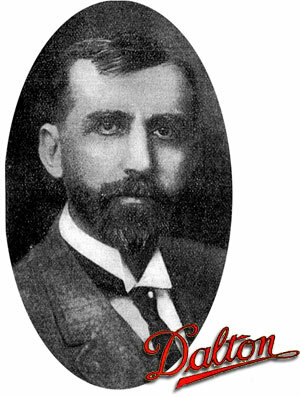 In his only effort to seek public office, Dalton was elected to the Missouri legislature by a large majority of votes in 1900. On 25 October 1887 James Lewis Dalton married Clara Beatrice Wright (b. Feb. 27, 1869—d. Dec. 12, 1940) of Doniphan, Missouri. To his union were born four children: Grover Wright (1889-1959), Charles Lewis (1891-1926), Phoebe Clara (1893-1970), and Mary (1899-1979). James Dalton died of acute appendicitis on January 11, 1926, in Cincinnati, Ohio, and was buried in Poplar Bluff.